As it was my third trip to Arunachal Pradesh with no future trips visible in the near horizon; I had decided that a visit to Tawang the district bordering Bhutan and China must be made. 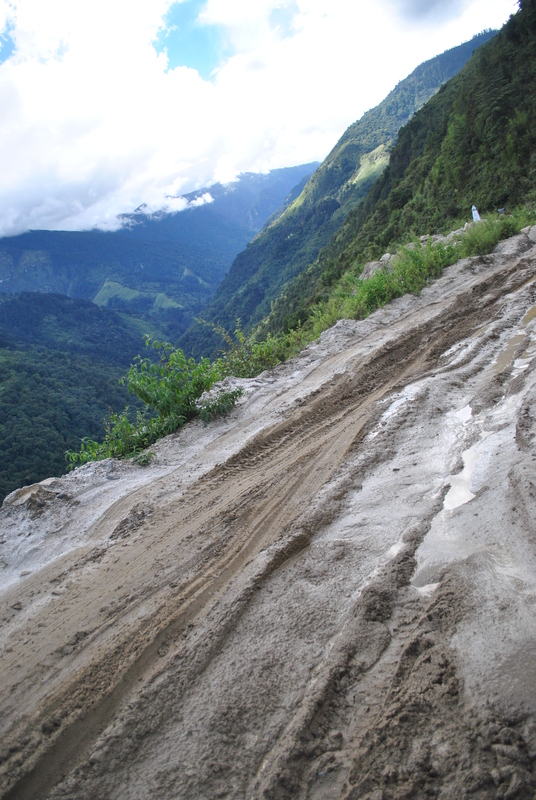 We began our journey from Dirang in West Kameng district at 7 am having been forewarned about the long and treacherous route to Tawang. It was only due to a miracle and our driver Bablu’s car maneuvering skills that our Tata Sumo managed to literally swim through the thick clayey mud road made worse with constant rainfall. BRO does try to keep the spirits up by installing inspiring quotes at regular intervals. One can only hope that they will apply these quotes on themselves someday. I am told that BRO has built amazing roads in Ladakh so there is hope! 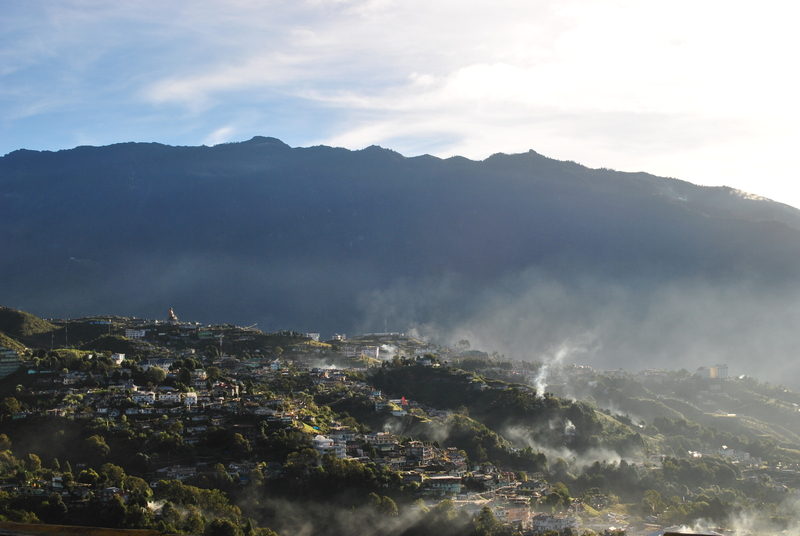 In the midst of the depressing state of affairs of BRO roads and corruption, the majestic beauty of the approaching Tawang district started to tease us as we slowly made our way from below the clouds to through and above them. Entire mountains of coniferous forests doing slow dance with moving clouds and fog transported me into a different zone. I felt myself melting into the river in the valley with my stretched out arms and legs blending into the mountains. The feeling of being interconnected with nature had never been stronger. Just then the car stopped at a Jaswant Singh memorial where the Army was handing out free tea and subsidized samosas. Jaswant Singh was one of the martyrs of the 1962 Indo-China war and had received the ParamVir Chakra for his valor in combat. I clearly hadn’t paid much attention to my history classes in school given how taken in I was by the story of the 1962 war. 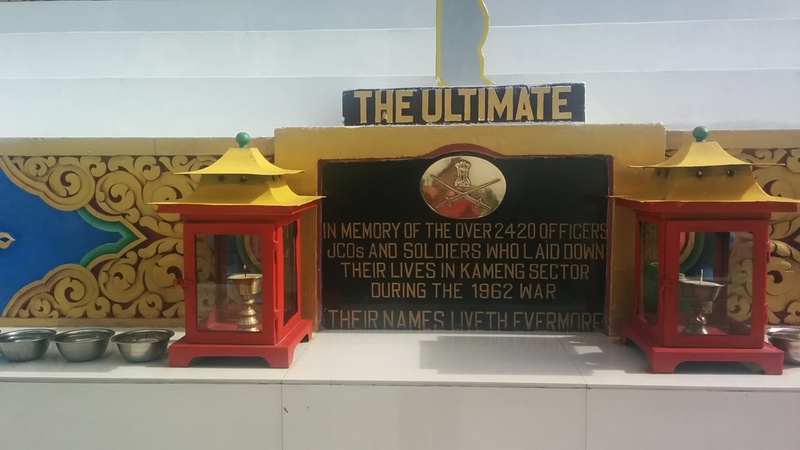 I later went to another War Memorial in Tawang, where a gracious army jawan gave me a personal tour of the memorial and explained the details of the war. I learned that India was totally unprepared for the China incursion and I was quite shocked to learn that the Chinese made their way all the way to Tezpur in Assam. The war ended with the Chinese declaring a unilateral ceasefire. I saw photos of the Chinese with AK 57s while the Indians had much inferior weaponry that too shared between 3 jawans. My army guide recommended I read the war memoir ‘Himalayan Blunder: The angry truth about Indias most crushing military disaster by Brigadier J.P. Dalvi’, a prisoner of the 1962 war to get a deeper understanding of how unequal the war was, the gross miscalculations and lack of leadership from the political and defense establishment and above all, the monumental sacrifice made by 2420 martyrs and numerous injured from the Indian army in defense of our motherland. No wonder the book was banned by the Indian Government after its publication. It is now available. The more important question today is, are we any better prepared should India and China go to war? 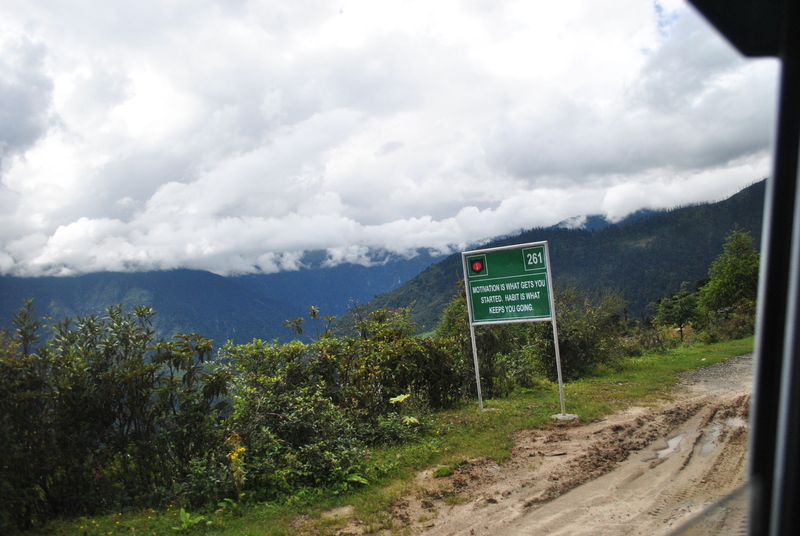 It took us approximately 4 hours to go from Tawang town to Bumla pass on the India-China border on bumpy roads. There is a Chinese city 40 kms from the border with rail connectivity….Hmmm….moving on. In the evening I walked from our guesthouse to the Tawang Monastery, one of the biggest Tibetian Buddhist monasteries outside Lhasa, Tibet. It was already late so by the time I reached the Gompa it was shut but a kind lama came and opened it for me. He along with another lama showed me around the Gompa and all the different statues and paintings. After kindly inviting me for a morning ceremony the next day, the lama excused himself and let me out into the alleys of the monastery. It was surreal being the only outsider walking along the narrow alleys with the flickering shadows of young lamas chanting in their rooms playing on the stone walls. Occasionally a lama would walk past me in a hurry on the way to an errand. 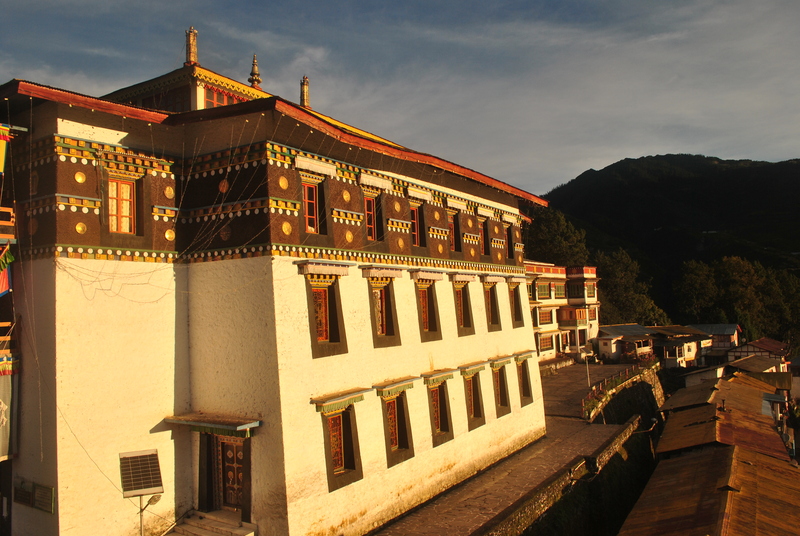 The lamas and the monastery are well connected with the local community. All three lamas I spoke to were from Arunachal Pradesh and had joined the monastery young, received training at Bodh Gaya and Mysore and come back to continue their practice. There is a tradition in Arunachal that if a family has three sons, the middle son joins the monastery. Such is the commitment of the local community to the monastery that in addition to giving their sons, they also give regular contributions to help run the daily affairs of the monastery. As I reflected on the sorry state of India’s infrastructure, corruption and seemingly unpreparedness to protect our border, their magnitude became smaller as a greater perspective and inspiration emerged from above the clouds at 10,000 feet surrounded by the mighty Himalayas and the wild raw material that we are made of. The lives of the army jawans, the lamas and the locals embodied a deeper understanding of how to live life. The former put their lives on the line for us day in and day out in subhuman conditions and with insufficient infrastructure. The latter two sacrifice their families and a worldly life to spend entire lives following the path of dharma in the quest to achieve enlightenment. Leading a path of devotion and sacrifice to what is in front of us is the only answer regardless of what is happening around us. If not now, then when. If not you, then who?